12 Very fine Hepplewhite mahogany "D" shaped sideboard of graceful design, distinguished by its beautiful inlaid patterns; the long drawer is centered by an inlaid Grecian urn in crossbanded and inlaid frame; the recessed serpentine cupboard doors below each centered by urn paterae; the top with an unique and beautiful border of repeat drapery inlay; the tapered legs with an urn motif; the stiles with diamond panels and floral paterae. Attributed to William Lloyd, Springfield, Massachusetts, circa 1790-1810. The attribution to William Lloyd is based on the similarity in form and inlaid detail to the masterpiece bearing the label of William Lloyd, advertised ANTIQUES, inside cover December 1934. 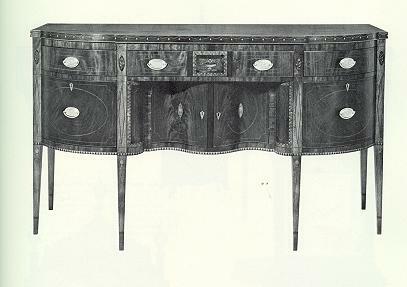 A sideboard of this form appears on Lloyd's engraved label. 71 1/4" long, 41 1/8" high, 24" deep. Photo Credit: American Antiques from Israel Sack Collection - Highland House Publishers Inc., Volume __ , Plate 4291.